‘pjur love – gives you more knowledge’ – under this motto, the pjur group is launching an intensive customer support service this year. Key Account Manager Stefan Daniel has been visiting different branches of NOVUM Märkte GmbH, the leading retail company in the Eastern Westphalia-Lippe region of Germany,to provide its sales teams with pjur product training. “The atmosphere was great and the sales staff were really interested. At the end of the presentation, everyone received our new training folders, which proved to be very popular with participants,” explains Stefan Daniel. 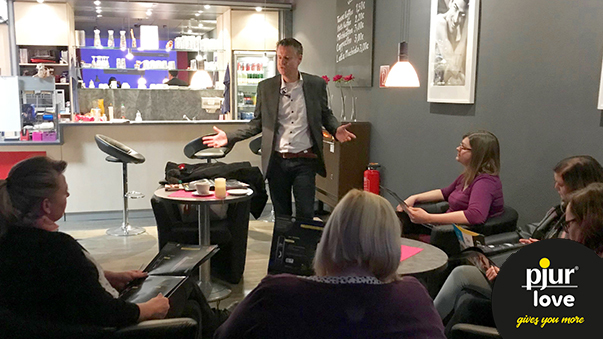 Michael Schnelle, Managing Director of NOVUM, was also impressed: “This kind of product training session is a great way to highlight the subtle differences between products and understand why they were developed. I’d like to thank Stefan and pjur for giving us this opportunity!” A total of six product training sessions were held in NOVUM branches in the towns of Bielefeld, Bad Oeynhausen, Osnabrück, Lippetal, Andernach and Kaiserslautern. NOVUM operates a total of 23 retail stores across the country.